Gophers and moles in Santa Barbara are known for causing damage to landscape, lawns and gardens. Additionally gophers and moles can cause damage to sidewalks, pavers and driveways because how their tunnels weaken the surfaces. Gophers and moles create dirt mounds, holes and they kill plants. Gophers and moles can also damage irrigation, utility lines and drip systems. 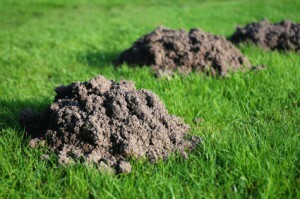 In order to prevent continual damage to your property, gophers and moles need to be controlled quickly and effectively. 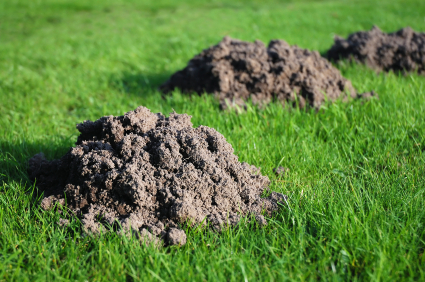 Gophers and moles often create tunnels to adjacent properties, so it is likely that your neighbor has been visited by the gophers and moles doing damage on your property. Even when your property has removed the gophers and moles, your neighboring property still has them, new gophers and moles will eventually move into your property. The way to identify a gopher from a mole is to look at the mounds. Gophers create a dirt mound in the shape of a fan moving outward from the center of the hole. Moles also leave similar looking mounds sometimes pushing up a lot of dirt making it hard for inexperienced homeowners to tell the difference between gophers and moles. One obvious sign of moles is their lifted ridges left behind as they travel through your yard. Gophers are herbivores so they eat plants. If your plants are damaged or disappearing, a possible cause is you have a gopher. 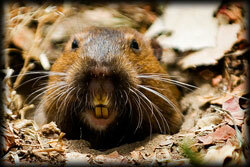 Gophers can make tunnels up to 200 yards in a year and move more than 2 tons of soil. Santa Barbara Pest Control: How do we get rid of Gophers? So-Cal Pest Control also known as” The Gopher Guys” specialize in gopher and mole pest control using the most effective, yet safe, methods on the market. Yes, we are the top gopher and mole exterminators in Santa Barbara County. Each employee at So-Cal Pest Control is licensed by the state of California to use restricted materials, as well as registered with the county to engage in pest control for hire. Our initial gopher control service consists of coming out to the site and treating all gopher activity until gopher control has been achieved. In addition to our initial service, we may recommend a monthly service. This helps to ensure that we treat and get rid of any new gopher activity before it has a chance to destroy the landscape. In these service visits, we are scheduled to come out and walk the entire property and treat any activity. This is all included in the price of the monthly service.